How to turn a lantern into a lamp - Lovely Etc. 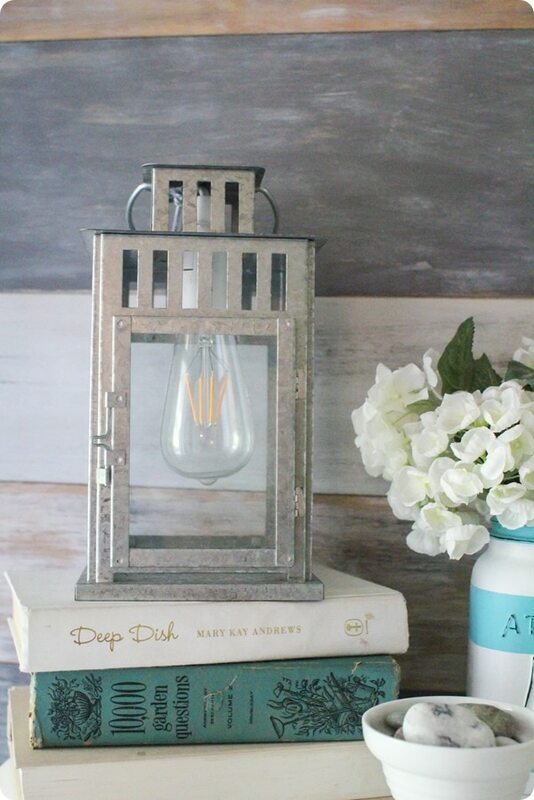 This DIY lantern lamp is one of those projects that is both incredibly genius and incredibly obvious all at the same time. Recently I replaced a bunch of candle lanterns on our porch with some fun string lights. Since I have an inexplicable need to repurpose all the things, I knew I needed to find a way to reuse some of the lanterns. 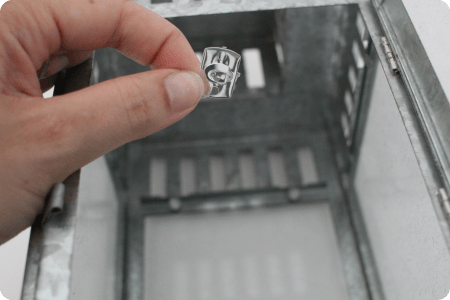 That is when inspiration struck – turn one into a lamp! The basic idea is so simple. 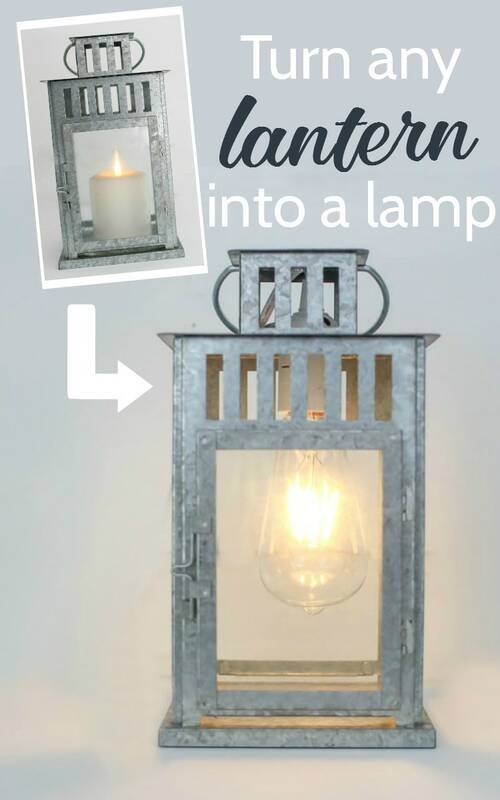 Take the candle out of an old lantern and put a light bulb socket inside instead. Simple. The only thing that is complicated is figuring out the actual details of how to turn a lantern into a lamp. 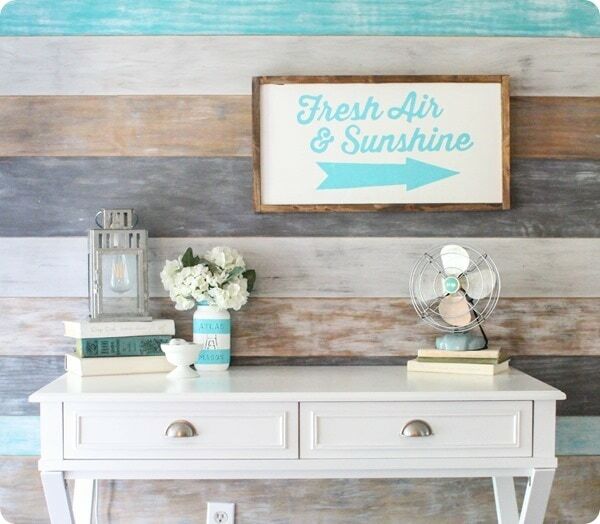 I’ve got all those details for you, plus, even better, I’ve also got 10 other DIY lamp ideas to share. 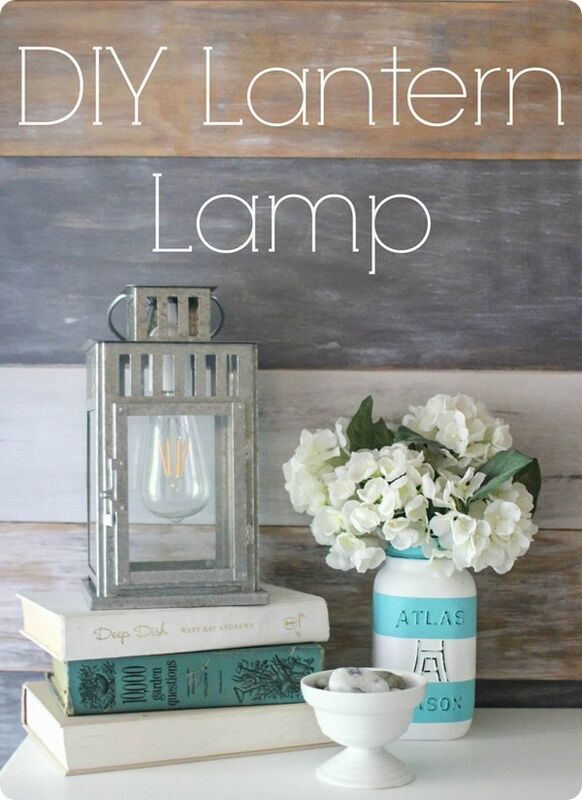 I teamed up with some of my favorite creative bloggers to bring you Lamp-alooza! All the lamp inspiration you could need. But first, my genius/obvious lantern lamp. 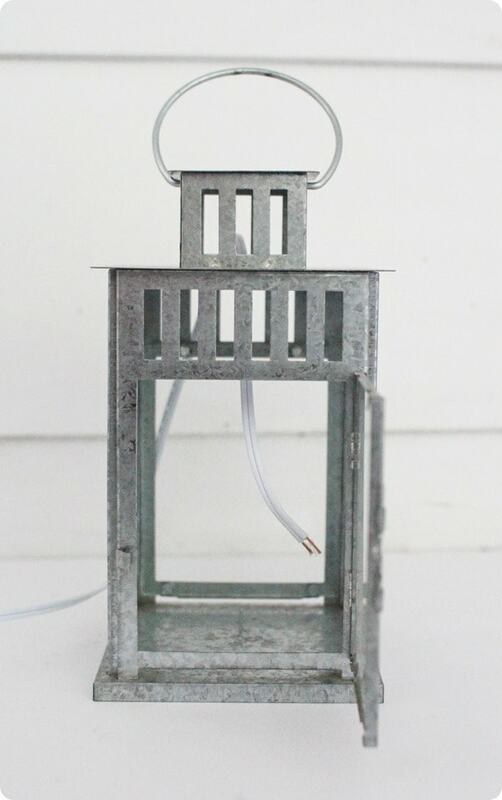 Lantern – I used this one from Ikea but any lantern made for candles will work. I think this is another great lantern choice. In order to get the lightbulb socket into the lantern, you have to do a little bit of work. And it involves messing with wires. That sounds scary and dangerous, but it really isn’t even that complicated. And it isn’t particularly scary either – the wires you are messing with aren’t even connected to an electrical source. First you need to take the socket apart a bit. 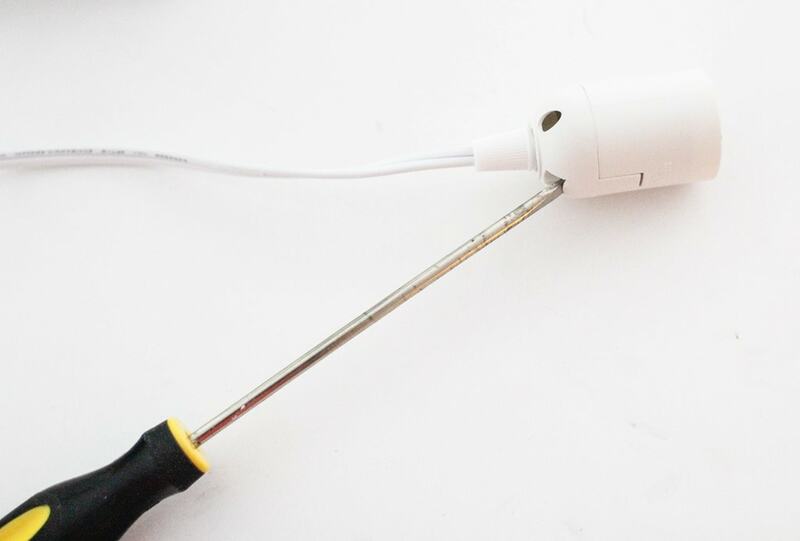 Use a flat head screwdriver to gently pop the socket apart. Then unscrew the three sections. Carefully snip each wire using wire cutters. Strip a small section of the protective coating from each wire end. 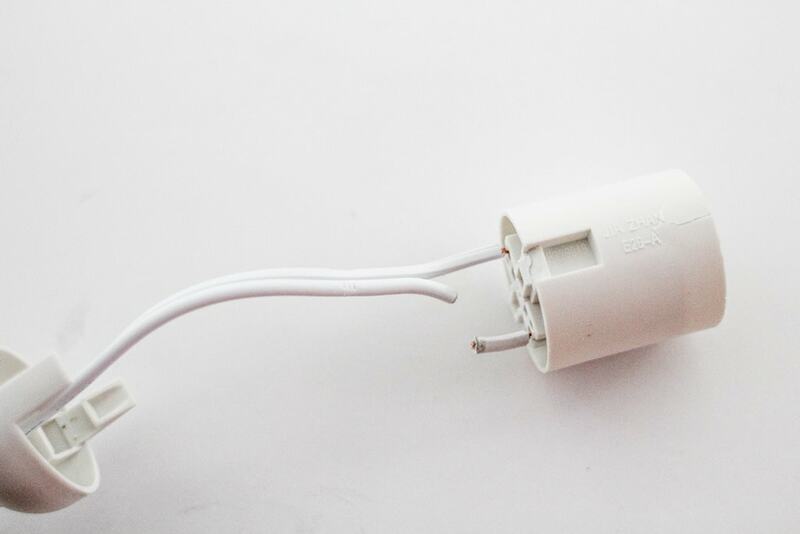 Slip the rest of the socket parts off the wire. 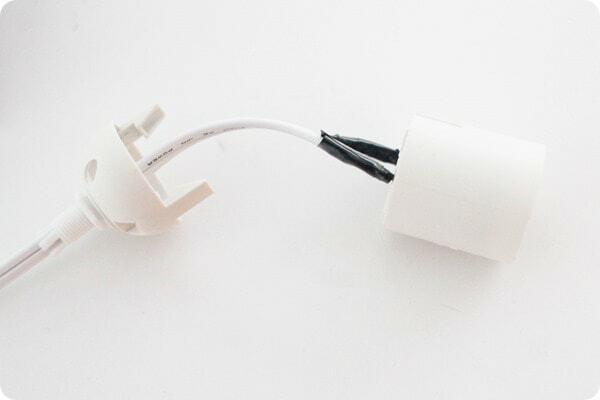 Put the bottom socket parts back on the cord once it is through the lantern. Reattach the two cords by twisting the exposed wires together. Completely cover all of the exposed wiring with electrical tape. At this point everything is all wired up, but the socket was just hanging loosely. Originally, I used duct tape to secure the socket to the top of the lantern. Take it from me, don’t do that. It only lasted about a week, before the tape gave out. Luckily I came up with a different solution that is much better. As for the cord to plug in the lamp, I used silver duct tape to attach it firmly to the back of the lantern out of sight. 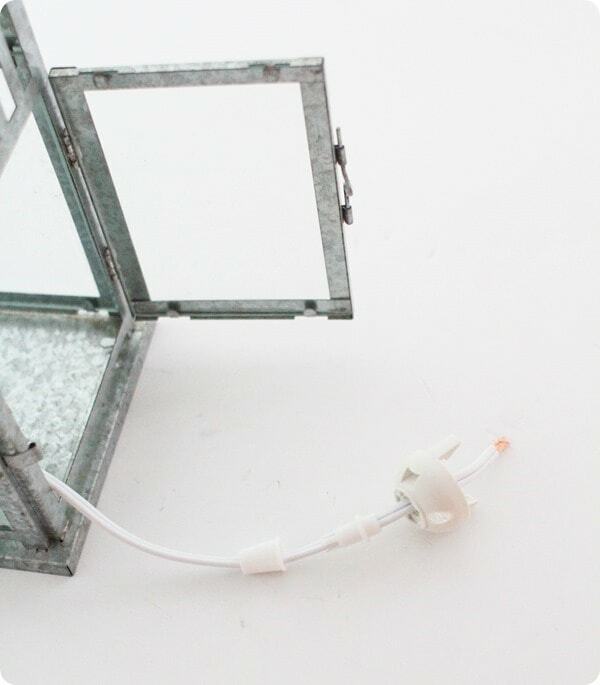 If you are using a different color lantern, just use the appropriate color tape to secure your cord out of sight. My lantern also had a small metal spike at the bottom of the lantern to hold a candle in place. It wasn’t in the way, but it seemed like a bad idea to leave a pointy spike below a dangling lightbulb. I just snipped it off with my wire cutters. It took a bit of muscle, but wasn’t difficult. And we had a lamp! 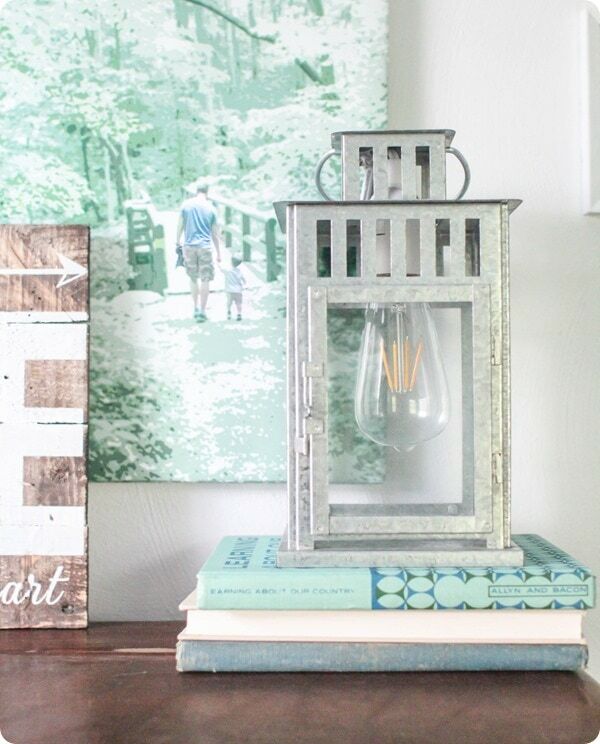 I really love this little lantern light. The Edison style light bulb is really important. A regular old light bulb would not be a good look. After doing some research, I chose an LED Edison bulb. The LED bulbs are more energy efficient, last longer, and from what I read, give out a less yellow light. I read tons of reviews (because I’m obsessive like that) and I have been very happy with the bulb I chose. It looks good both lit and unlit. The color of the light is similar to that of regular incandescent light bulbs (instead of overly yellow). And the amount of light it gives off is perfect for a lamp. It isn’t enough to illuminate a room, but is way brighter than a nightlight. 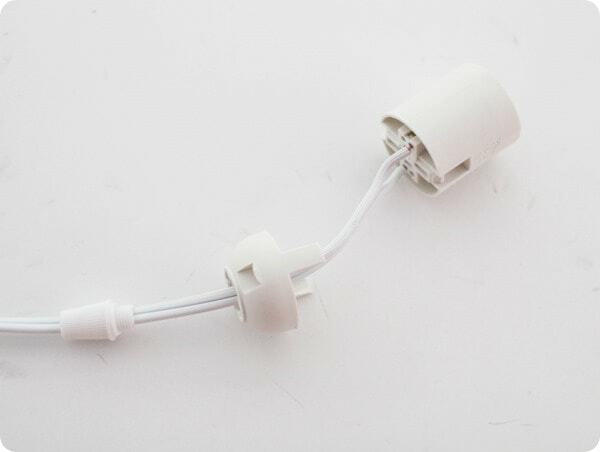 Perfect for lighting a dark corner or lighting a hallway at night. I tried it out in our foyer and it looked amazing. But I actually made it to go in my son Griffin’s room, so I reluctantly moved it there. Luckily it looks great in there too. And it is the perfect fit for his little explorer bedroom. I wanted to hang it on the wall next to his bed, but then I remembered he is a three year old and there is no way it would last a week dangling next to the bed. So instead it is on top of his dresser. (His tall dresser). It is safely out of reach and he is more than happy to leave it that way as long as he can use the switch to turn it on and off whenever he wants. I’d love for you to pin this so you can remember it! And now you’ve got to check out the rest of lamp-alooza! 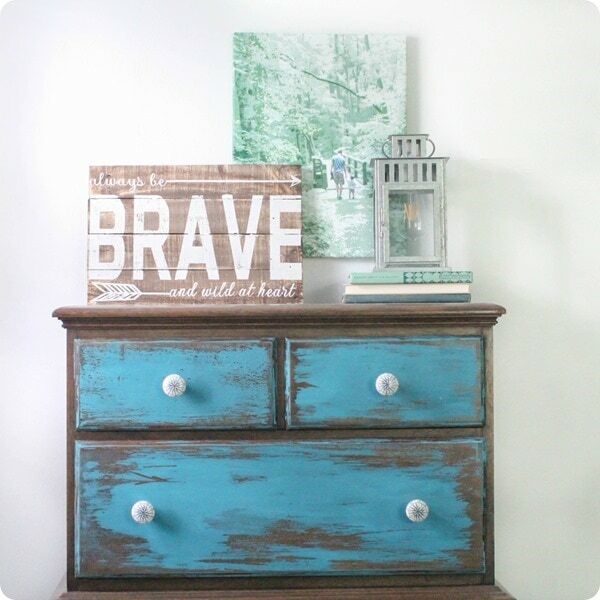 There are 10 more awesome lamp makeovers to check out. Yes, these would be perfect on a deck! Thanks Amy! I love it too! What a cute project! I love the Edison bulb in there too! It really makes it stand out as something special! Thank you for playing along! Pinning! Thanks Cat! The Edison bulb was definitely a must! I had no idea this could be done, I LOVE lanterns and this idea is brilliant! Thanks Cindy! I feel like I see so many great lanterns every time I am out – this just makes it that much easier to actually use them! I love this!! 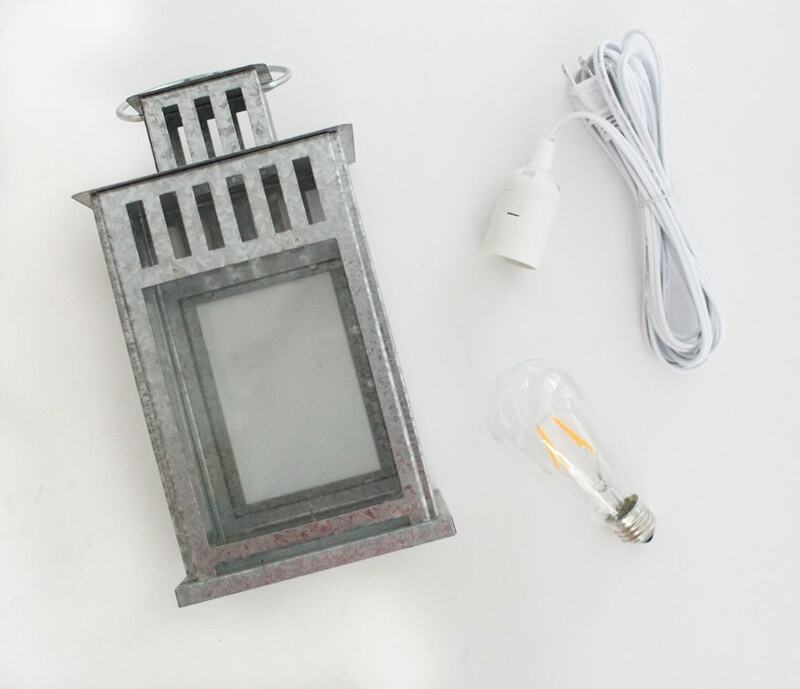 The Edison bulb is the perfect bulb for your lantern lamp. I just can’t get over the whole look!!! I have a lantern that is very similar and I’m eager to recreate you lamp!! Thanks Stephanie! I was so excited when I thought of this idea! This is so great! I love the Edison bulb! I’m confused…what happens to the cord? 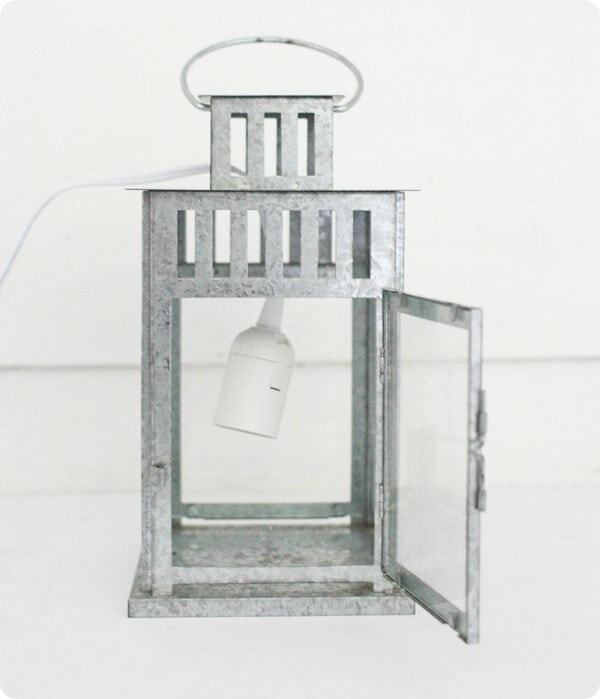 I see it hanging in the photo before you attach it to the lantern with the command hook, and then it disappears in the next photo. Is the cord still attached? Is it hanging down the back of the lantern? Yikes! Sorry for that Jessamine. I thought that was in the instructions but apparently not so I just added it. I secured the loose cord to the back of the lantern with duct tape. Since my lantern is silver, I used silver tape but you can use any color that matches your lantern. It might not sound elegant, but because it is on the back of the lantern, nobody sees it anyway and the duct tape actually blends in really well. You did a fantastic job on the lantern. It turned out beautiful! Great idea for hiding the cord, and the Edison light bulb fits perfect with the lantern. This would be my favorite lamp as well. Thanks Linda! Now I really think I need to make a few more because I keep moving this one from room to room! Where do I sign up for your news letter? 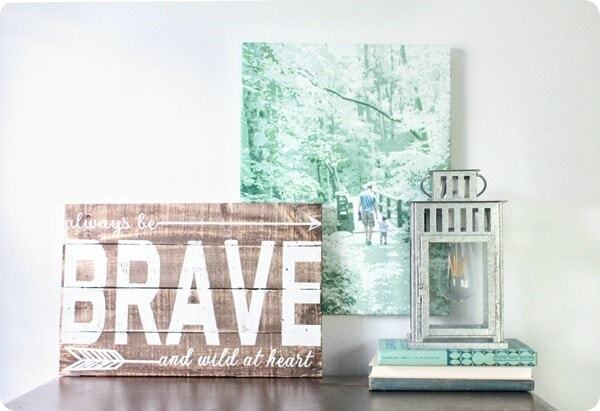 Hi Pam, if you go to this page, there is a sign up form at the bottom: https://www.lovelyetc.com/free-guide-best-paints-every-project/ Thanks! 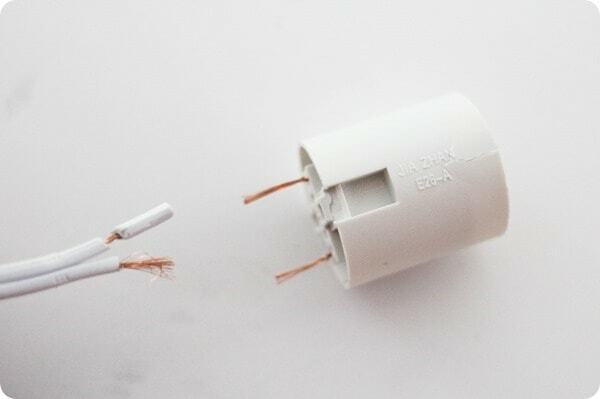 If you look inside where the wires go into the socket housing you will see little holes. With a Bobby pin or anything straight, solid and small enough to fit you will be able to release the wires instead of having to cut them and then reattach with electrical tape. Just make sure to mark at least one wire and the housing on the same side to make sure the proper wires are in the proper place. 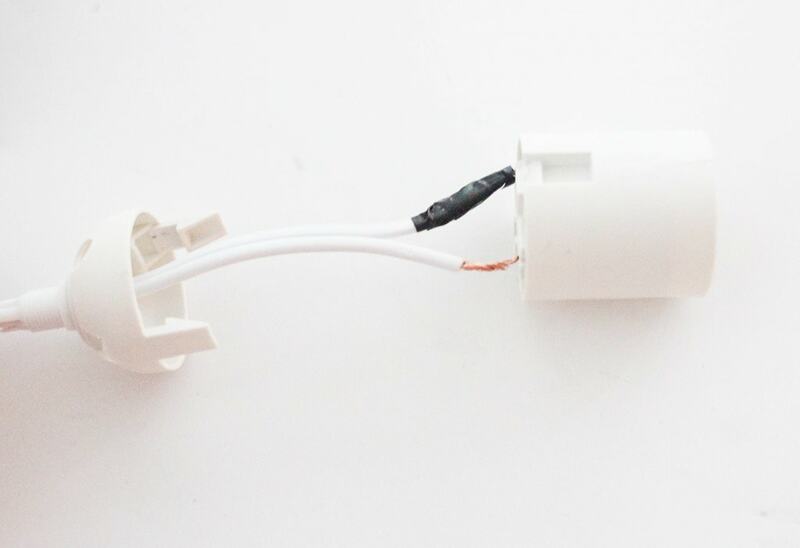 I’m not an electrician but I prefer to put the wires back in the same side I removed them from….it’s a quirk I guess.